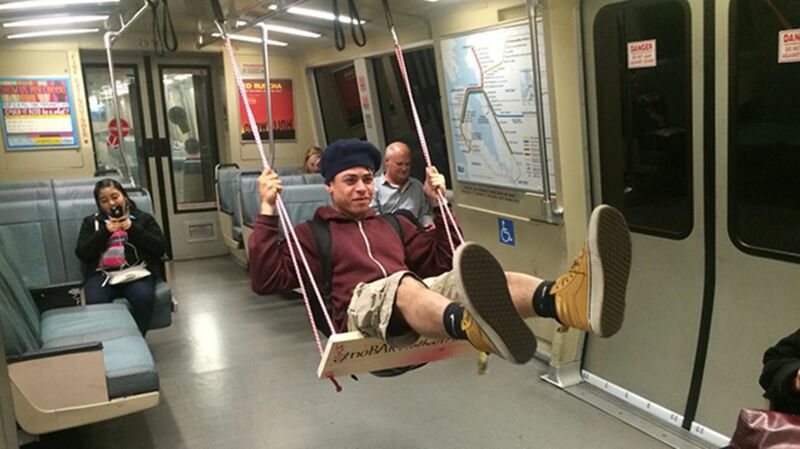 Last month, a few lucky riders on the San Francisco Bay Area’s BART system watched as their normal commute turned into a playground experience. They were invited to take a seat on a swing hung from the middle of the subway car, as Laughing Squid highlights in a recent post. San Francisco-based artist Hunter Franks recently declared himself BART’s Artist-in-Residence, coming up with various projects to make the system a more joyous communal experience. In order to inject a little whimsy into riding the subway, in late August, he installed a working wooden swing, attaching the ropes to the hanging straps of one of the train cars. He then invited commuters to take a turn. On his website, he explains that “there can't be any better place for a swing than a subway train where hordes of adults commute to and from work stuck in a small screeching steel box.” The response was overwhelmingly positive, according to Franks. “People were thrilled and the number of smiles on the train increased 100 percent,” he writes.